We use the ULTRA line of vaccines; these effective vaccines have half the volume of other vaccines, with a reduced number of reactions reported. We believe vaccine protocols should be tailored to each pet's unique lifestyle. FVRCP (Distemper or Upper Respiratory vaccine) ULTRA is recommended once every 3 years after booster vaccines have been given. For adult cats, we also offer blood testing (antibody titers) in lieu of vaccination, to determine if they have adequate protection from disease. Leukemia ULTRA is recommended yearly to cats that have exposure to other cats: indoor/outdoor, are boarded, or have other cats in the house that go outside. Rabies vaccination is recommended yearly to all cats. We use only a cat specific, adjuvant-free rabies vaccine which is safer for our feline friends. Reminder: rabies vaccines are required by law in Washington State. DAP (Distemper or Parvo vaccine) ULTRA is recommended once every 3 years after booster vaccines have been given. 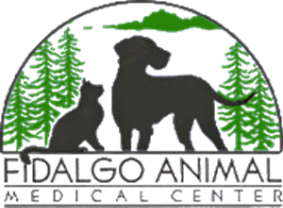 For adult dogs, we also offer blood testing (antibody titers) in lieu of vaccination, to determine if they have adequate protection from disease. Leptospirosis (Lepto) ULTRA is recommended yearly to dogs in our area. Lepto is a bacteria that lives in stagnant water in areas that have farm animals and wildlife. It is contagious to humans. Kennel Cough (Bordetella) is a vaccine, similar to a human flu vaccine, given to dogs that have contact with other dogs. Bordatella vaccination is recommended annually for at risk dogs. We use only the oral vaccine, which is the most effective. Rabies vaccination is recommended every 3 years once booster vaccines have been completed. Reminder: rabies vaccines are required by law in Washington State. Canine Influenza (Flu) is and new virus. This vaccination is recommend for pets that travel, live in high exposure areas (Chicago), or if it is required by the groomer or boarding facility.